Thalberg looked baffled, then smiled and explained what he meant by “lovely music.” It had to have Chinese themes, and, as the people in the film were peasants, there was not much dialogue but a lot of action. 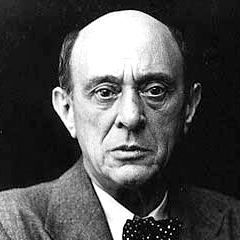 … I translated what Thalberg said into German, but Schoenberg interrupted me. He understood everything, and in a surprisingly literary though faulty English, he conveyed what he thought in general of music in films: that it was simply terrible. The whole handling of sound was incredibly bad, meaningless, numbing all expression; the leveling monotony of the dialogue was unbearable. He had read the Good Earth and he would not undertake the assignment unless he was given complete control over the sound, including the spoken words. “What do you mean by complete control?” asked Thalberg, incredulously. We find much the same model, this time with Theodor Adorno in the role of the émigré who does not quite understand how things are done, in Katia Mann’s Unwritten Memories. 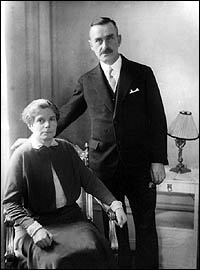 It differs from the paradigm only in assigning the role of the American to her husband, the novelist Thomas Mann. Cobbled together from recorded interviews and television broadcasts, transcribed and then further revised in 1973 by her son Michael Mann, the book was published in German in 1974 by Fischer Verlag and promptly translated into English and published by Knopf in 1975. It is unclear that the final product was worth the effort. Katia Mann was no Salka Viertel: devotion to her husband drips from every page, merging with a desire to settle some old scores with Adorno, a desire that does not appear to have been tempered by the passing of time or an interest in historical accuracy. Katia Mann’s general point was that Adorno “acted positively foolishly with his pretentiousness and conceit” (unlike her husband, who’d figured out how to be seriously pretentious and conceited?) and that he had a fixation on Thomas Mann, which resulted in his thinking of himself as the actual author of Doctor Faustus (think Single White Female as it might have been remade by Fassbinder). And that’s the way the matter was handled. The book turned out to be by Horkheimer and Adorno: it was their Dialectic of Enlightenment. My husband received a copy, and he said to Golo, “I don’t understand anything about this. Couldn’t you write the review?” Golo wrote it, and it was published in The New York Times under his father’s name. I checked the Historical New York Times database and, as expected, found no review of Dialectic of Enlightenment by Mann or, for that matter, by anyone else. Undeterred, I sent emails to the archivists at the Times and to the Mann Archive in Zürich to see if, perhaps, a review might have been written but not published. The Times reported that they could neither confirm nor deny that such thing existed because their records for that period were either long vanished or impossible for them to search (I’ve forgotten which). The Mann archive reported that they were familiar with Katia Mann’s claim but had no copy of such a document in their possession. Wondering whether there might have been some confusion in the transcribing of her story, I bought access to the Los Angeles Times database and found no review of Dialectic of Enlightenment there, either (but I did learn a bit more about the escapades of certain other associates of the Frankfurt school — more on that in a latter post, perhaps). Sometime after the publication of The Story of a Novel, Adorno turned up in Mann’s garden with a copy of Dialectic of Enlightenment. Mann tried reading the book, but (like everyone else who has ever tried to read Dialectic of Enlightenment) found himself confused. So he passed it off to his son Golo, who read the book and wrote a review. Golo’s review was published in the New York Times under his father’s name. Now, claim 6 is certainly untrue: no review of Dialectic of Enlightenment appeared in the New York Times. But this still leaves the possibility open that claims 1-5 are true, but that the New York Times had no interest in the review. It is, however, highly unlikely that claims 1-4 are true, a fact that fatally undermines the plausibility of claim 5. Once we’ve worked our way through all this, however, we will see that a version of claim 6 might have been accurate after all, but thisfact is hard to reconcile with anything else in the story. The simplest problem involves claim #2. The German text of Story of a Novel was first published in 1949. Dialectic of Enlightenment was published in 1947. For Katia’s story to make sense, Horkheimer would have had to (1) read Story of a Novel, (2) discover that he wasn’t in it, (3) become upset about this, and (4) hatch the scheme that sent Adorno running over to Mann’s garden to beg Mann to write a review of Dialectic of Enlightenment for the New York Times. 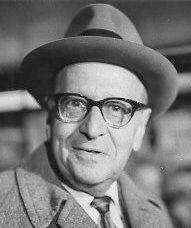 Were Horkheimer to have read Story of a Novel it is possible that he would have been offended by his not appearing in it (Horkheimer, after all, appears to have been a rather difficult man, but — then again — he was dealing with a lot of very difficult men). It is also plausible that Horkheimer was under the impression that it was within Mann’s power to get Dialectic of Enlightenment reviewed in the New York Times — he seems to have taken to heart the account that he and Adorno had given of the culture industry in Dialectic of Enlightenment and was convinced that the entire industry was one massive racket. With the right friends and the right connections, anything was possible. But the dates just won’t work. By 1949 the time would have passed for a review of Dialectic of Enlightenment. While it is conceivable that Horkheimer was dense enough not to realize this, there is one further argument against claim #2: over the course of 1949 it seems that, if anything, Horkheimer and Adorno were interested in suppressing reviews of Dialectic of Enlightenment. From their correspondence (both the published material in the Horkheimer-Adorno Briefwechsel and in other materials that I’ve seen in the Lowenthal Papers at Harvard) it is clear that he was concerned that the not entirely suppressed radicalism of the book (which had been subjected to a massive elimination of Marxist terminology prior to its publication) might complicate the efforts to find a new home for the Institute for Social Research either at UCLA (where the plan seems to have been to enter into some sort of affiliation with the newly established Sociology department) or back in Frankfurt. It would appear, then, that the last thing Horkheimer might have wanted in 1949 would have been a review that called attention to Dialectic of Enlightenment. This still leaves open the possibility that, as later as 1949, he could still have held out hope that a review of Eclipse of Reason might be placed in the Times. As I’ve discussed elsewhere, Horkheimer was quite concerned that Oxford University Press wasn’t doing enough to “plug” the book (is there anything quite as pathetic as an academic trying to sound savvy? ).4 But by 1949 he appears to have resigned himself to the fact that the book was not going to garner the coverage in the popular press for which he was hoping. There are also good reasons for doubting Katia Mann’s claim — however plausible it might initially seem — that Mann tried to read Dialectic of Enlightenment but couldn’t make sense of it. 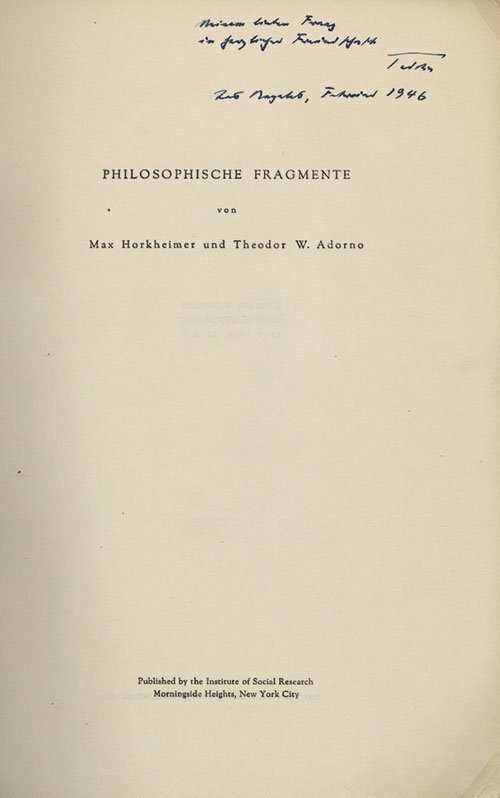 It turns out that the Thomas Mann owned a copy of Philosophische Fragmente — the 1944 mimeographed version of Dialectic of Enlightenment — and that it contains markings on eleven pages.5 The annotations cover the first chapter and the two excursuses, suggesting that Mann made it at least as far as the chapter on the culture industry before giving up. It is hard to square Katia Mann’s story with this evidence: it seems hardly plausible that it would have taken Mann 141 pages to realize that he didn’t understand what he was reading. It is far more likely that he stopped reading the book at this point because, by then, he had found what he needed to find. To understand why he was reading the manuscript it helps to know how he got it in the first place. Copies of the Philosophische Fragmente had been sent to five hundred friends and associates of the Institute for Social Research at the end of 1944. Given Mann’s stature in the exile community, it is reasonable to assume that he would have been sent a copy. The fact that he lived a few blocks away from Horkheimer makes it even more likely. And the fact that, while working on Doctor Faustus, Mann had been reading Adorno’s work and meeting with from from 1943 onwards makes it almost certain that Mann would have received a copy as soon as it became available. This means that Mann would have possessed a draft of the Philosophische Fragmente four years before Katia Mann’s story has him receiving a copy of the book from Adorno and being asked to review it for the New York Times. Adorno’s reasons for putting up with the theft of his own work can be explained, at least in part, by the considerable difference in status between our two protagonists. At this point Adorno was a forty-year old German academic who had written a considerable body of material but, as a result of the disruption of exile, had been able to publish rather little of it. Mann was old, internationally recognized, and widely viewed as the leading figure in the émigré community. Adorno’s letters to his parents from this period suggest not only did he realize that Mann was an Important Figure, but that he also enjoyed working with him. And, perhaps, Mann had already offered assurances that his debts to Adorno would eventually be acknowledged, as indeed it was in The Story of a Novel. Finally, it is worth noting that Horkheimer also seems to have had a stake in Adorno’s collaboration with Mann: in the reports on Institute activities that he dutifully filed with Columbia University (with which the Institute retained a tenuous connection, despite Horkheimer’s having decamped to Los Angeles) he listed Adorno’s service as a “consultant” to Thomas Mann as evidence of the work in which the Institute was engaged. All of this is enough to suggest that (1) Thomas Mann was quite familiar with Dialectic of Enlightenment prior to Adorno’s alleged appearance in his garden and (2) Horkheimer may well have thought that he was owed something for the services that Adorno had performed for Mann. But the service in question does not appear to have been a review of Dialectic of Enlightenment. Claim 6: The Devils Strike a Bargain? There was, in fact, a book review that appeared under Thomas Mann’s name in the New York Times Sunday Book Review of December 11, 1949, though Katia Mann was mistaken about the title of the book and its author. The book in question was Paul Massing’s Rehearsal for Destruction. A Study of Political Anti-Semitism in Imperial Germany and Horkheimer would have had considerable interest in having it reviewed in prominent places. Massing was an associate of the Institute for Social Research and Rehearsal for Destruction was one of the volumes that appeared as part of the “Studies in Prejudice” series sponsored by the American Jewish Committee, the same series that would soon produce the work that would gain fame for Adorno: The Authoritarian Personality. In 1949 Horkheimer had ample reasons for trying to call attention to the works that were appearing in this series. He was under considerable pressure from Columbia to demonstrate that the Institute for Social Research was, in fact, capable of producing important and widely recognized works. He also had enemies at the American Jewish Committee and it was important for him to demonstrate that the money the AJC had provided was not being wasted. And the fact that it was becoming clear that Columbia was no longer interested in continuing its connection with a Horkheimer-led Institute for Social Research also argued for trying to garner as much publicity for the series as possible. The interest attracted by the series might aid in the negotiations with UCLA and could also make the case for the reestablishment of the Institute at Frankfurt as a center for the dissemination of “American style” social science. Let me, then, come to Katia Mann’s aid and try to work up a more plausible version of her story. Horkheimer could well have sent Adorno to Thomas Mann’s house with a copy of Rehearsal for Destruction, reasoning that Mann owed Adorno and the Institute a favor. But, pace Katia, it is hard to see why Mann would have found anything in Rehearsal for Destruction that might have proven difficult for him to understand (after all, he’d read Adorno’s Philosophy of New Music and known which passages were good to steal and also seems to have attempted to do the same thing with the Philosophische Fragmente). It is, on the other hand, quite easy to see why Mann might have had little interest in reading it: there was nothing in it that was relevant for his current writing. So, he could very well have farmed it out to his son Golo and then passed it off to the New York Times as his own work. But his doing so makes for a different (and, dare we say, crasser?) story than the one Katia Mann told: in place of a great, if baffled man, confronted by a strange request from a former collaborator, we have a deal being worked out between two émigrés who are behaving in exactly the same way as Hollywood studio heads operated in a vertically organized monopoly where writers and actors were bound to exclusive contracts with studios but could be lent out, for short periods of time, with the expectation that similar compensation might be offered. Horkheimer, having lent Adorno out to Mann, had every reason to expect something in return. Mann recognized that compensation was owed and farmed it out to a member of the family. For all of its failings as a historical document, Unwritten Memoirs turns out, in the end, to be a familiar Hollywood story. This entry was posted in Uncategorized and tagged Adorno, Dialectic of Enlightenment, Exile, Horkheimer, Thomas Mann. Bookmark the permalink.